It was an intense weekend. Seriously, though: I snapped that photo after the Madison, the last event on the schedule, which (thanks for asking!) was incredible. Fast and tense, we had to wait until the end of 200 laps to crown the winners. 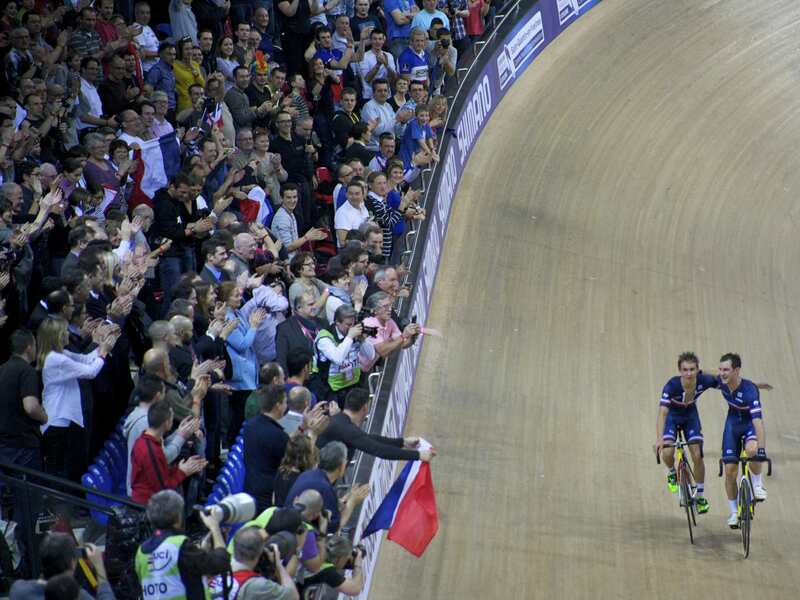 France (Morgan Kneisky & Bryan Coquard) drew first blood, taking the first sprint 20 laps in. It was a smart move to bank points as early as possible; the finish would come down to the smallest of margins. But the finish seemed a long way off at the time, and Great Britain snuck off solo with 170 to go, managing to take the first lap. It was a lead they’d hold for most of the race, despite France, Italy, Belgium and Spain trading attacks. No team wanted to let anyone else off the front, although Colombia managed to escape with 110 laps left. But they got stuck in no man’s land, unable to lap the field before the momentum of the 6th sprint brought them back into the fold. The winning move turned out to be Italy and Spain’s attack with 40 laps to go: they won the sprint and just kept going, probably hoping to catch the others off guard. But France and Germany weren’t going to be caught out, and Belgium went along too, and all of a sudden the selection was made, and we had a five-team race on our hands. When Spain took the second-to-last sprint, there was only a six-point difference between first and fifth place. Australia jumped next, no doubt hoping to finish on the same lap as everyone else, but to no avail. So it would come down to the last sprint. Italy and France were the strongest, ratcheting up the speed with two laps to go and taking the first two places – in the sprint and on the podium – for themselves. Spare a thought for Italy, who missed out on gold by one point, and for team Spain, who, tied on points with Belgium, could have taken bronze if they’d finished better in the final sprint. But this is why I love the madison: for the story, for the changing of fortunes, for the strategy and the speed. We couldn’t have asked for a closer contest to finish the track season. 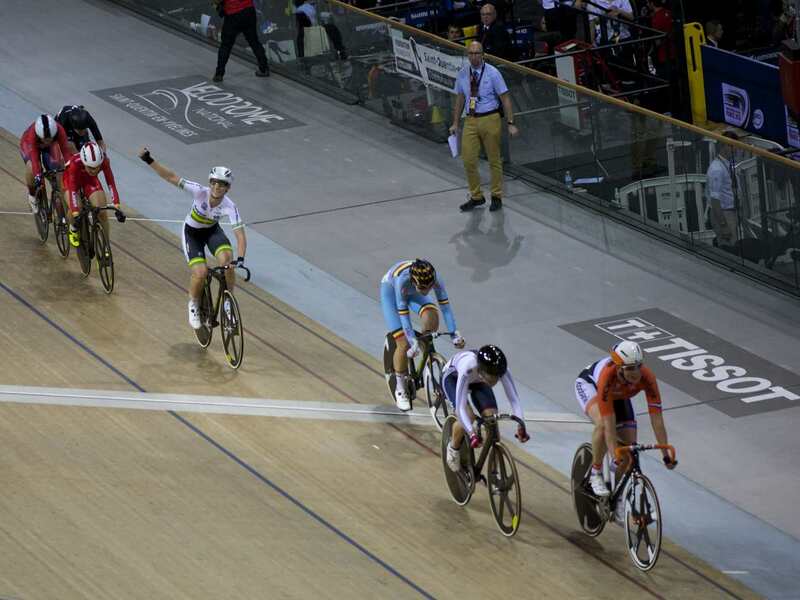 The women’s omnium was another highlight of the weekend. 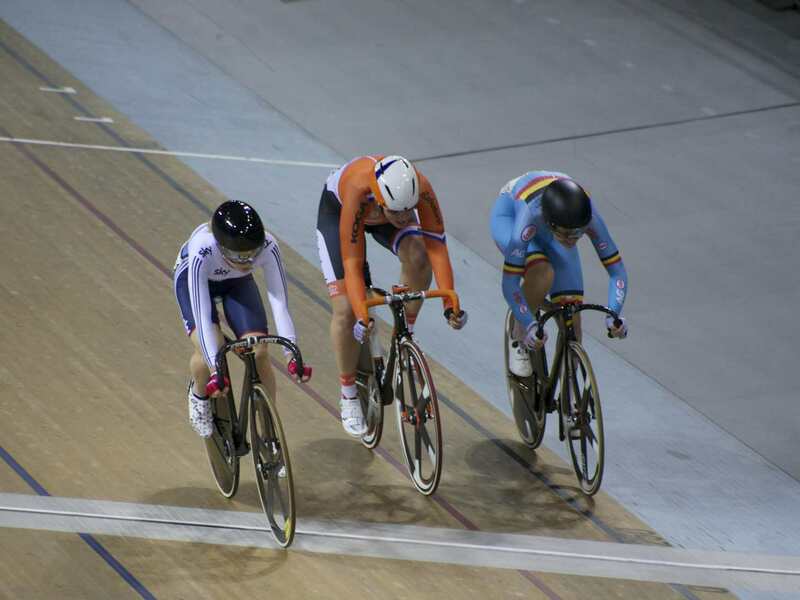 In Saturday’s scratch race, Tatsiana Sharakova, Caroline Ryan, and Ausrine Trebaite worked together to take a lap, and eventually Amalie Dideriksen did as well – solo! With these four taking the majority of the points, Annette Edmondson pipped rival Jolien D’Hoore in the bunch sprint for the line, valuable points which would help her to the top step of the podium. The women’s (omnium) elimination finished Saturday night, a race so good that it kept all of us at the track until the very end. When reigning omnium champion Sarah Hammer was eliminated to take 10th place, I swear I could hear her swear from the top row of the stands. 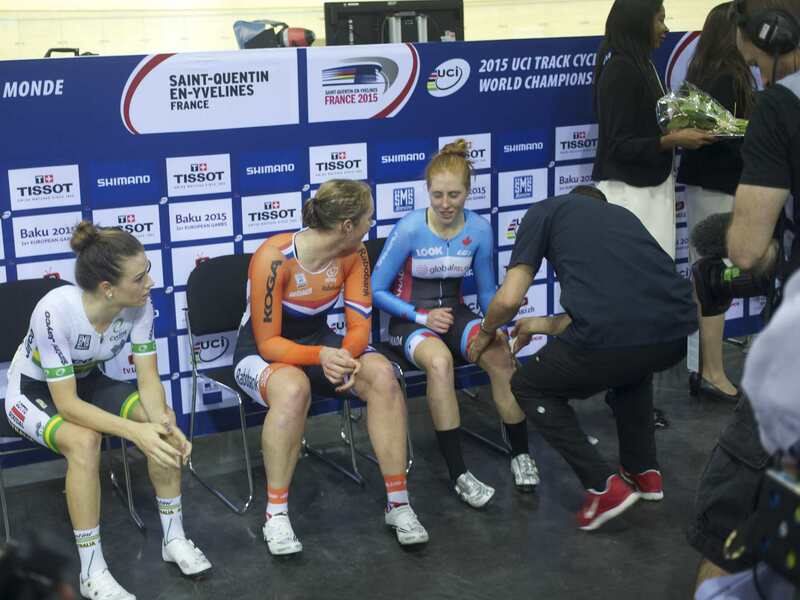 Jolien D’Hoore took third, and then Laura Trott caught Kirsten Wild off guard to take the sprint. Well, I say “off-guard” like I know what I’m talking about. Ms. Wild also raced the non-omnium scratch race earlier in the afternoon, winning impressively by getting on the front with two laps to go and holding off the field. Chapeau to Allison Beveridge, who crashed with twenty-something laps to go, and jumped back in to take bronze. Speaking of screaming fans: it must be said that the crowd was partisan², but polite. Yes, they go crazy – mostly when there’s a French rider on the track – but they pay attention to other racers as well: gasping for close finishes and close calls, applauding brave attacks, booing the officials when they relegate racers. All of this made it impossible not to turn your head when a French rider was competing, especially when the sprinters took to the track. Sadly, I missed the men’s keirin held on Thursday, but the sprint competition (which started on Saturday) was good even from the very first rounds. Honorable mention to Callum Skinner, up against Grégory Baugé in the first round: he went full gas when he heard the gun, hoping to catch the defending champion off guard. No dice – he was caught on the back stretch – but the crowd loved it. Things got a little bit wonky in the répechage rounds, because three-up sprints meant that François Pervis had some help from his French teammate Michaël D’Almeida. Rules are rules, I suppose, but it’s hard not to feel bad for Stefan Bötticher, who posted the fastest time in the qualifiers (and was world champion in 2013), but was denied a fair fight in what should have been his second chance to get back into competition. François Pervis³ racing against Grégory Baugé was the standout match in the sprint competition. Both are multiple world champions, both are strong and cunning sprinters, both have fan clubs whose members wear matching t-shirts, and, of course, both are French. 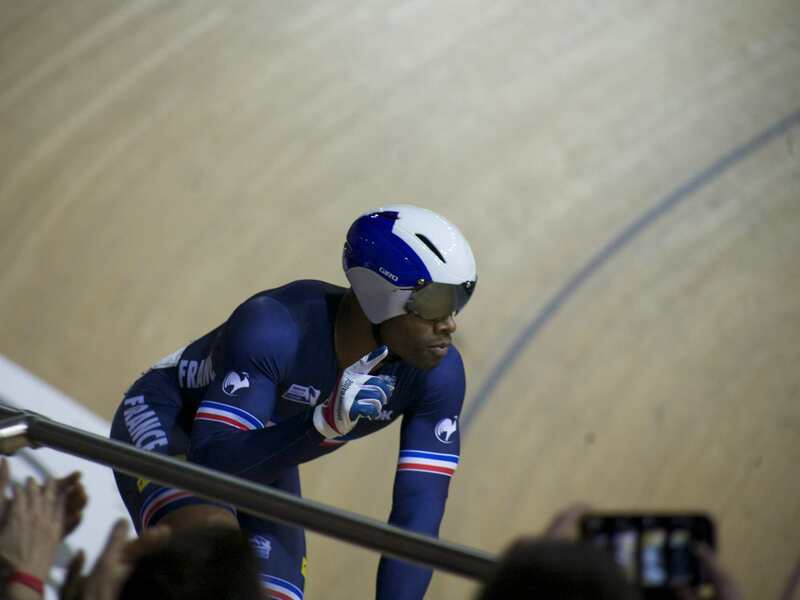 I had seen them race last fall in Grenoble, but to see them compete with the noise of 5000 people screaming elevated the competition to another level. Pervis took the first of three sprints, but it would be the only loss Baugé would suffer en route to the gold. The security guards at the French National Track just don’t stop hassling racers, fans, or fake journalists – such is their commitment to being in the way. 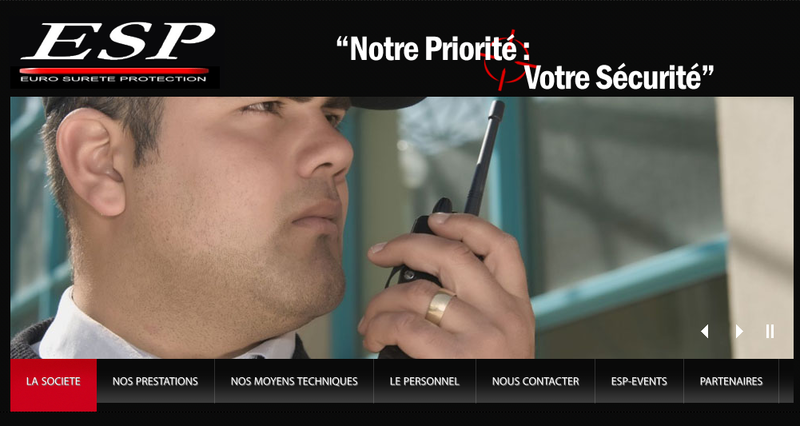 ESP, the private security provider for events at the track, is the kind of walkie-talkie-and-beer-gut-based organization that employs people men who hold up the self-checkout lane at the supermarket, because they certainly have three items over the 10-item limit (either because of their counting skills or just because they’re above the rules) and for lack of the reading comprehension skills to efficiently operate a touch-screen. 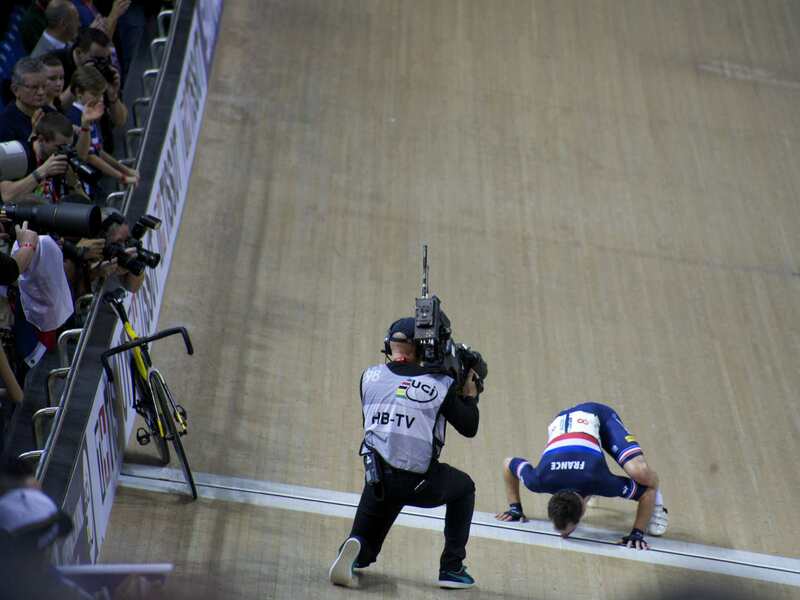 The last big story of the weekend was that of Fernando Gaviria, who started the weekend as The Guy That Beat Cavendish and finished the weekend with an omnium gold medal. It wasn’t as easy as it sounds though, he crashed twenty laps into the points race but jumped back in to hang on to the lead. Thomas Boudot’s attacks were the most evident, of course, because of the crowd, but the group hung him out to dry. I counted four attacks by the time the race is over that amounted to nothing; maybe he should have hooked up with Aaron Gate, who managed to take three laps by the time the race was over – and was rewarded for his efforts and smart racing by jumping from 12th up to 5th place by the time the points race was done. But then, even leaders Glen O’Shea, Elia Viviani, Fernando Gaviria and Aaron Gate were shut down when they attacked with 30 laps to go. Pity for Viviani that he didn’t have the legs to attack again, when rival Gaviria was stuck at the back of the pack four laps later, but this is an easy comment to make when you’re watching the race from the top row of the stands. And I’ll keep going with the armchair commentary: I tipped de Buyst for the madison (indeed, he won the points race), but both are going to be forces to be reckoned with next year. See you in London? 1. First one of you seven readers to identify that reference (author & work) gets a prize! And no fair google-ing, smart guy. 2. It seems to me that complaints about the partisan French crowd were quite common in the Anglo cycling press. I don’t think a non-partisan world championship crowd exists (nor will it, ever), but: what’s up, London 2016? 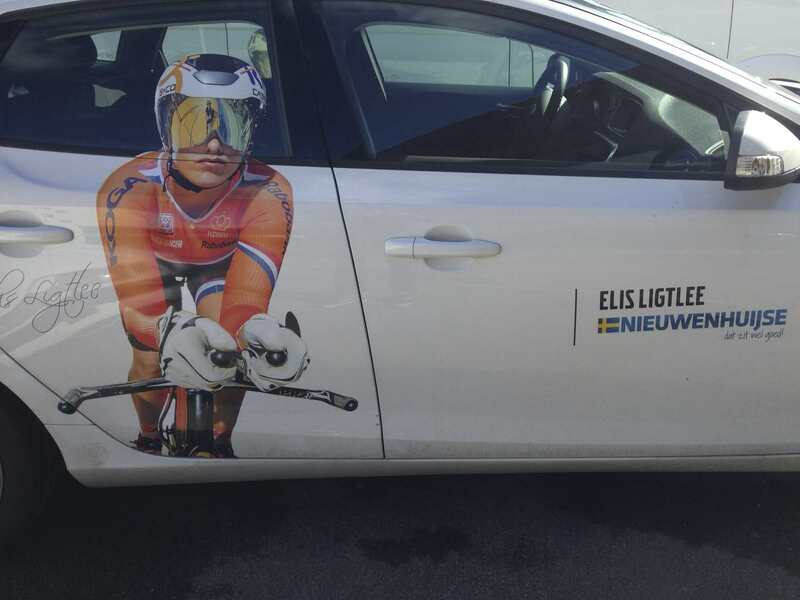 Are y’all going to cheer for sportsmanship, for brave attacks, for riders from countries that haven’t thrown a bunch of money at their national cycling programs? Or are you going to cheer for a flag? 3. I’ve linked this Rouleur article before, but it’s too good not to link it again. 4. Ahem, not ink, but ones and zeros.